If you’re interested in buying my work you can either approach me directly (please read on! ), or consider visiting a gallery that stocks my work. I try to keep up-to-date here with galleries that have stock, but it’s advisable to contact them before travelling. As for buying directly from me; sometimes I have pieces available. If not, I’m happy to discuss particular requests or commissions along similar lines to pieces I’ve made. It’s not unusual for me to have several existing commitments, so please contact me well in advance of any present-giving occasion you’re buying for. After all, I am only one person, and a person who likes to go hiking for weeks at a time! Each piece is unique, so prices vary according to complexity and time taken in the making. 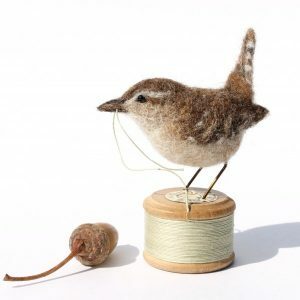 As a guide, the smallest ‘Bobbin Wren’ starts at £115, through to ‘Thread Bears’ at £195 – £225. ‘Jenny Wren on a Sewing Machine’ is around £255, ‘Hare Planes’ and ‘Plane Sailing’ bears from £355, and £345 – £425 for a ‘Running Stitch’ hare or ‘Narrative Thread Bear’ on a vintage toy sewing machine. Bobbin Birds on vintage cotton reels (or spools), are a diminutive 6cm total height at their smallest, up to around 10cm. Bears are usually 10 – 12cm (ish) standing upright on their woolly feet (not including anything they may be standing on), as are Hares, to the tips of their ears. So a Hare like ‘Fiddly Digits:Itchy Breeches’ on a letter block is roughly 17cm tall in total.